This is a classic game. Classic in that it's a great game; classic in that it deals with historical fantasy and classic because it's been available for free, for years. From a quick glance at the full-size preview it looks exactly like the free PDF: two slender columns of text per page, great tracts of white space to boost the page count; essentially this is the kind of "layout" one expects from a free game from 15-or-so years ago. Is this exactly the same game with different art? If not, what are the changes between the original free PDF and this new release? This version includes lots and lots of colour art, various full page, fully detailed A4 maps of all regions in the Desert Kingdoms, a dedicated sailing and sea trading section, with detailed double spread maps of the ports of the Mediterranean, a complete solo chapter that allows one player to run Zenobia, not just as one character, but as a group of characters, also a mass battle system that can handle tens of warriors up to a few hundred or many thousands, all with the quick roll of a dice. The free game is still available at Zozer Games' website as normal, however, but obviously it lacks these extra features. There is also a softback available on Lulul.com, where the PDF is offered as a free download. The price of the PDF here isn't dependant on page count, though, but on the art and content. Is there a pod and pdf bundle available? There is, but for various reasons the POD is available on Lulu Publishing's site. There are instructions on the Zenobia product page, there, to request a free copy of the PDF. I missed this and have already got the PDF. No worries, I'm off to Lulu to get my hard copy. Love this Paul, it is tub thumping fun! I'm running a game of this at 7hills.org.uk next year (may use Vagabonds of Dyfed as the engine riffing off your text). Hi Paul! The latest update (December 13) doesn't provide much information on which if anyone of the files were updated. What exactly has changed? Three very minor typo edits - but I like to keep on top of them! Sorry for any confusion. 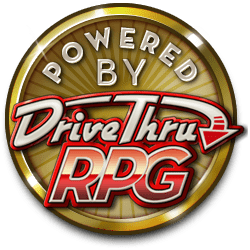 I have credits on DriveThruRPG, no softcover from here??? I'm afraid not. Differences between the way I publish and create layout and the DriveThru POD software means I use a different Print on Demand source. Is there a chance to play the same epoque in Europe or later in Dark Ages or classical Medieval time? Are there any rules that cover it well? The rules would stand up extremely well, but you would need to change the names and descriptions of the Past Experience suggestions - no legionaries or gladiators in 13thC France, for example! For Christian kingdoms, prayer and the dedication of wealth to a monastery would replace setting up expensive stelae to the gods for increasing experience. Could you elaborate on what rules were clarified or changed since the original game? I just took a look at old version and it seems very cool but certain rules Eg. multiple opponents, 2 weapon fighting, were either unclear or seemed like "why wouldn't I do this?" situations. Also could maybe elaborate on changes (additions or omissions) you made to this new addition which YOU were most pleased with? The rules are left unchanged from the 2004 version, but new rules added only regarding Mass Battles, Sea Travel, Trading Ship combat and playing Zenobia solo. Page 76:"Fighting From Advantage- Player characters can and should exploit advantages that exist within the gameworld to maximise their chances of victory. These advantages include the following manoeuvres: Ambush, High Ground, Cover, Opponent fallen, Blinding foe, Mounted versus standing, Retreating foe. All of these (and many others too numerous to mention) make attacks easier and often more effective. The ‘out-manoeuvred’ combatant must make an impromptu FATE roll to try to negate his opponent’s tactical manoeuvre. If failed, then the manoeuvring combatant gains a +1 on his attack roll for each advantage that has an influence on the fight that round. A particular advantage will only last 1 round and cannot be repeated during that combat encounter (unless it persists, such as being mounted). " So what you have to make an extra roll of FATE on every round for everyone who is out-maneuvered when there is any sort of advantage/disadvantage in order to give a bonus to the next combat...See more roll? Do advantages cancel each other out? I'd suggest just house-ruling that an advantage lasts as long as common sense says it does. The Fate roll I'd restrict to establishing a new advantage, or trying to get rid of an existing one that works against you. Well, the idea is that using items or parts of the immediate environment will provide a +1 for one round, in an attempt to make combat more fluid and more dynamic, and less of 'standing still and hitting each other repeatedly'. So, jumping from stairs, throwing sand in the opponent's face, using a Combat Crippling Blow to knock an opponent to the ground, tipping up a burning brazier, etc are all single time effects. If mounted, or more persistent, I think the common sense approach is to for the opponent to roll FATE only once. A great game, and one that I definitely don't regret buying! My only complaint is that there's not more of it. But when I mentioned the game on a mailing list, someone replied saying they knew the game from years back and that it also had supplements- Ionia, Persia and Aegyptus. Is this true, and if so, when can we expect to see them available? I'm planning to release the supplements: Ionia, Aegypt and Persia, as free Drivethru downloads with updated layouts. I'm guessing this is an update of the "Zenobia" of 1999/2004? Yes it is, but that free version is still available on the Zozer Games website. Any chance a print on demand version is coming? A softback edition will be released on LULU within around 10 days. Hi Joseph, Zenobia is now available as a 300 page softback with colour covers and b&w interior pages. Find it on Lulu.com with a quick search for 'zenobia'. I cannot put a link here due to Drivethru's fair and understandable publisher's conditions. Your preview tells me exactly nothing about this game, other than the table of contents and a few splash pages. Hi David, good point! I've shifted the page numbers to include the introduction and part of the setting chapter. Thanks for your comment! Is this Cepheus Based, or Cepheus "adjacent"? No, the game is a stand-alone fantasy role playing game, using a 2d6 mechanic.